Sorry Wizard World, your reign is over. 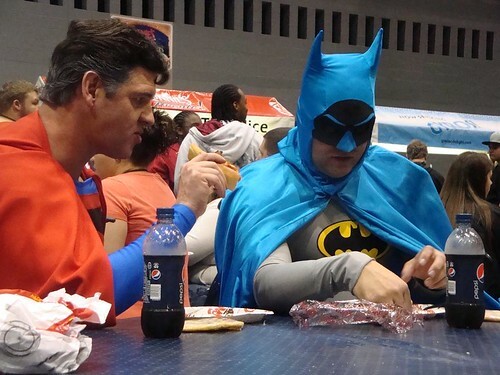 April 13-15, 2012 marked the third annual Chicago Comic & Entertainment Expo. Held at McCormick Place in Chicago, this year’s C2E2 featured props and costumes from the Captain America movie; a variety of publishers including Marvel, DC, and Dark Horse; local celebrity John Cusack, Star Wars’ own Anthony Daniels; and The Walking Dead’s Lauren Cohan and Steven Yeun. And honestly, folks, that’s barely scratching the surface of the event. Let’s just cut to the chase: Sorry Wizard World, your reign is over. 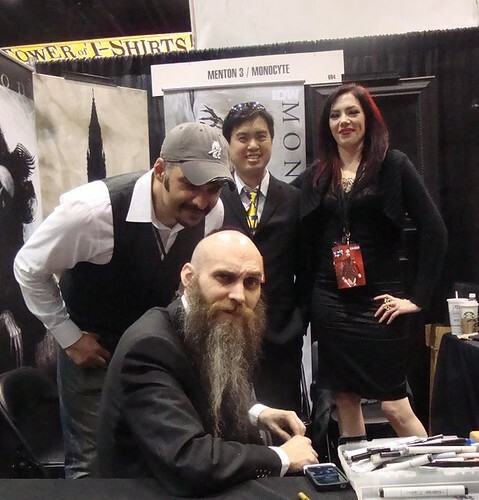 With attendance skyrocketing and a variety of well-respected creators in attendance, it’s safe to say that C2E2 is the preeminent comic book convention in the Midwest. According to an interview in Publishers Weekly with show runner Lance Fensterman, the size of the show floor doubled since last year and as an attendee I’m here to tell you that the show floor was absolutely packed. Unfortunately, I wasn’t able to attend all three days but I did make it to the show on Saturday, no doubt the busiest day of the event. While portions of the floor were quite manageable, bottlenecks were unavoidable and at times, overwhelming. There were more than a few occasions that I felt a strong desire to scream. Mind you, I was the guy who decided to cart his entire family including wife, four-year-old daughter, one-year-old son, and an 11-year-old nephew to the show. Pushing a stroller through moderately heavy foot traffic is bad enough; forcing your way through teeming masses of backpack-wearing geeks and ornately costumed superheroes, stormtroopers, hobbits, and anime-inspired characters is maddening. I found myself surveying the various vendors offering steampunk costumes and weaponry in the hopes that someone offered a cowcatcher that could be attached to the front of my son’s stroller. At a typical comic convention, Artist Alley is the slowest area of the show. Tumbleweeds are as common as the candy offered by desperate artists hoping you’ll take a moment to give their hard work a chance. Not so at C2E2, where the wide aisles were full of excited convention-goers eager to purchase original art, prints, and obtain autographs from their favorite artists and hopefully discover some new talent as well. Of course, when Artist Alley includes talent such as Bill Sienkiewicz, David Peterson, Katie Cook, Art Baltazar, Tim Sale, Skottie Young, Jill Thompson, and… do I seriously need to go on? Exactly. When you’ve got an Artist Alley that looks like this one, you’ve got to expect some heavy traffic. At the risk of just turning this article into a huge list of names, I’m gonna throw a few more at you: Tom Morello, Geoff Johns, Tony Moore, Len Wein, Neal Adams, Sean Astin and Val Kilmer. Oh yeah, and David Newell, whom you may recognize as none other than Mr. McFeely from Mr. Rogers’ Neighborhood. Yes, Mr. McFeely was there! The event managed to cover every base of pop culture while keeping a heavy focus on comic-book talent and from a fan’s perspective, it was a total success. After the show was the party at the Hyatt. The bar was packed to the gills with convention attendees and pros, further strengthening the bond between fan and talent. Seriously, folks, where else will you get the opportunity to buy your favorite artist a drink and personally thank them for the entertainment they’ve given you? Where else can you see your friend absentmindedly stumble around a corner and nearly run smack dab into Neal Adams, also wandering through the lobby in search of the elevators that would take him to the safety of his hotel room? That’s worth the price of admission right there. I wish I could offer you a more well-rounded look at this years’ C2E2, but as I said, I opted to make this year’s show a family event. While that prevented me from attending some of the panels or waiting in line for an autograph or sketch, it also gave me the opportunity to share our passion for pop culture and sequential art with the next generation. And honestly, I’ve been to my share of conventions; it’s more fun this way. Navigating through the crowds with a stroller undoubtedly sucked, but running into my friends Rafael Nieves and Dan Dougherty in Artist Alley as they promoted their collaborative and respective works and getting the opportunity to introduce my young son to Raf’s beautiful four-month-old daughter was worth missing out on Marvel’s Cup O’ Joe panel. Okay, we both know I wouldn’t have attended the Cup O’ Joe panel anyway, but you get the point. As wonderful as it is to experience a convention, it’s even better when you get to share it with someone new and introduce them to the fun and passion that you’ve become accustomed to. And while discussing Tiny Titans with Art Baltazar is a lot of fun, it’s even better watching your daughter smile as he draws a picture of Krypto for her. But no matter why you’re at the show and no matter what you’re looking for, you’re bound to find it at C2E2. This was my first year in attendance and I can guarantee it won’t be my last. The convention has grown exponentially every year and I can’t imagine what kind of awesomeness next year will bring.